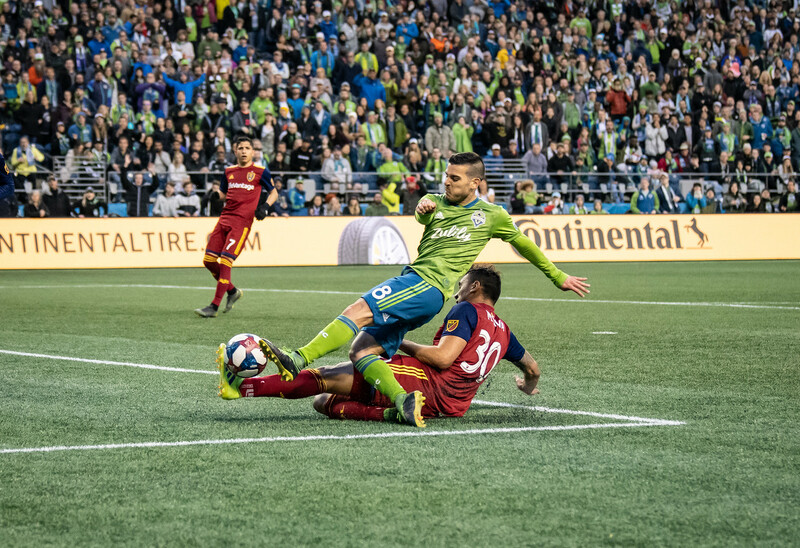 The newest team in MLS, FC Cincinnati, struck first with an opening cracker of a goal, but it was the Seattle Sounders who ended the night on top sailing to a 4-1 victory. Prior to kickoff, the Sounders presented Sigi Schmid’s wife and family with the Golden Scarf, a Sounders honor given to a select few members of the soccer or Seattle community. The crowd raised their scarves to honor Schmid, a loss that the Sounders community felt deeply. As kickoff opened on the Sounders 10th season and FC Cincinnati’s inaugural season, the Sounders pressured early. Raul Ruidiaz sent in a firing header in the 3rd minute, forcing an early save from goalkeeper, Tyton, that hit off the post. In the 13th minute, FC Cincinnati opened their MLS goal scoring account with an absolute stunner from Leonardo Bertone. 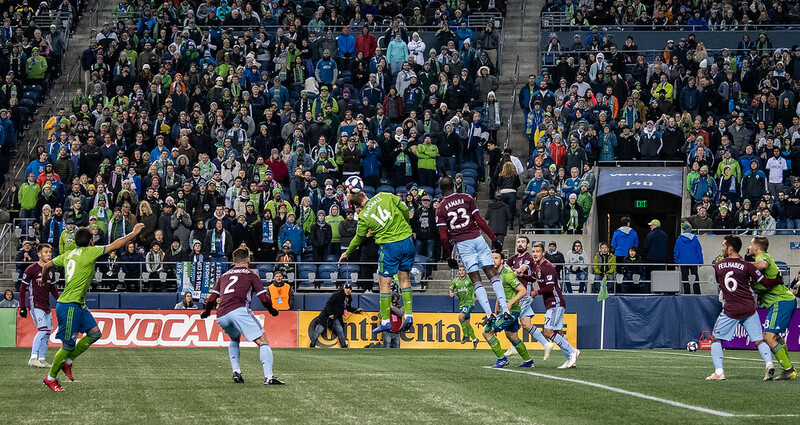 However, their lead was short lived when Kelvin Leerdam found the equalizer in the 27th minute after connecting on a deflected cross from Nicolas Lodeiro. The rest of the game was simply a showcase return for Jordan Morris. After waiting 500 days to start in an MLS match after recovering from ACL surgery, Morris slotted home two goals in 10 minutes. His first goal curled past the keeper in the 33rd minute, ending in a full-team pile up of celebration. The stadium cheered to one of the loudest volumes in years, rejoicing for the joy of their hometown boy’s return to the score sheet and the field. In the 43rd minute, Morris powered home a left-footed rocket assisted by Victor Rodriguez to give the Sounders a 3-1 lead. Raul Ruidiaz tallied his own goal in the 87th minute to close the game 4-1. Celebrating their 10th season in the league, players from the inaugural season returned to CenturyLink to be honored in the opening ceremony. They were also joined by Sigi Schmid’s widow, sons, daughter, father and grandchildren. It was a somber moment for Sounders fans to celebrate the team and man that started it all a decade ago. Emotions were high from the start Saturday night, but peaked when Morris first put the ball in the back of the net. When every member of the team joined him in celebrating, their joy was echoed by every fan in the stadium. While walking back to midfield, Nico grabbed Morris by the shoulders, pointed to him, looked up towards the crowd and cheered. In return, Morris broke away from the rest of his teammates and gave a fist raise and clap to the crowd. Having an in-from Morris will greatly benefit the Sounders this season, who struggled to get started last season. But if his first game is any indication, Morris and the Sounders are storming into their 10th season. Hello, from the Emerald City! My name is Ashley Savage and I am beyond excited to be covering your Seattle Sounders FC this season for MLSFemale. While I’m new to reporting, I’m well-seasoned at being a pundit. Sports fandom was a way of life in my house growing up. My parents were multi-sport college athletes at the University of Southern California and, as their only daughter, I was heavily involved in both the playing and supporting of college and professional sports teams. When I moved to a suburb south of Seattle at the age of 6 (shout out to Maple Valley! ), soccer instantly became a way of life. I’m fairly certain that it’s an unwritten rule all girls living in Washington State must enroll in soccer for at least one season before age 8. For most of my friends it didn’t stick, but for me, it became an obsession. Mia Hamm and Alexi Lalas posters littered the walls of my childhood bedroom, much to the disappointment of Devon Sawa, I’m sure. In my teenage years, my club team would be ball girls for the USL Sounders games. I remember watching these grown men play HARD and thinking they were the ultimate professionals. When the announcement was made that Seattle would be receiving an expansion team in 2009, I was away at college. I watched that first game from my couch in awe that the team I used to shag balls for had become an MLS team. A team that in its inaugural season shattered league attendance records, made the Western Conference Semi-Final and won the US Open Cup. How could you not love this franchise? After spending a few years abroad teaching ESL in South Korea, I finally returned back to the Seattle area in 2011. Shortly after, I met a guy (an inaugural season ticket holder, he would insist I add) whose love for Sounders was deeper than any fandom I’d ever encountered. We joined season tickets, got married in 2014 and even wore our wedding attire to the Portland game the following day where we got to be down on the field, high-five legend Roger Levesque and take pictures with DeAndre Yedlin. In 2016 we met a Future Sounder who had a due date the same day as the MLS Cup Final. He was born 6 days later to a wonderful world where the Sounders were reigning MLS Cup champions, which is the greatest way to give birth to a child, in my opinion. It’s a beautiful life here in the Pacific Northwest and I’m looking forward to reporting on the greatest franchise in MLS! On Sunday night, the Seattle Sounders took a hard 3-0 loss to the LA Galaxy. 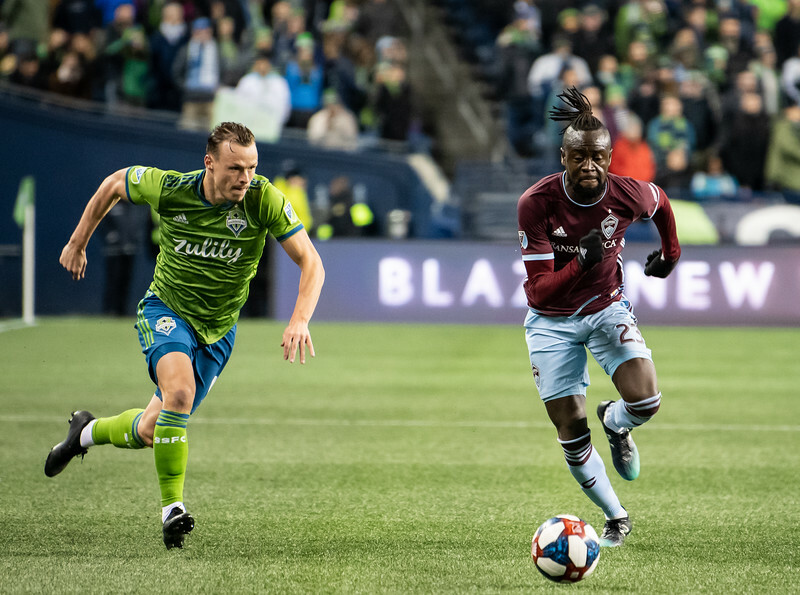 After a streak-breaking loss to the Philadelphia Union last Wednesday, the Sounders failed to bounce back and add another 3 points to their playoff push. Things were looking up, as Raul Ruidiaz returned to the lineup after suffering a minor right ankle sprain. 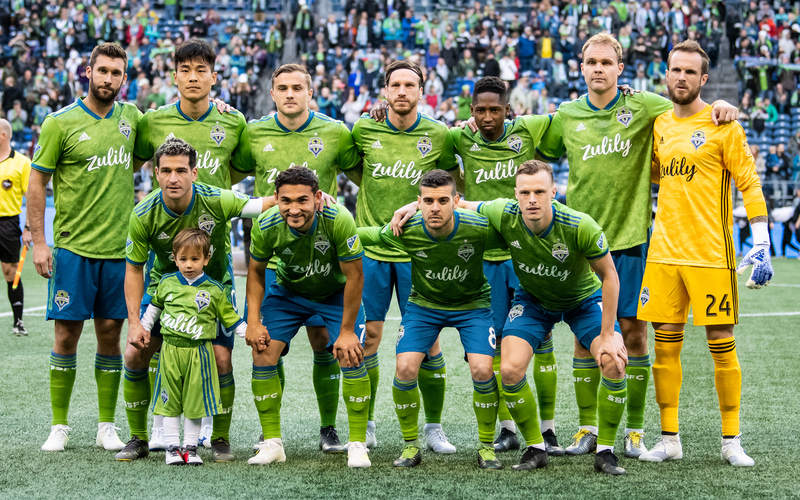 The Sounders moved to a 4-4-2 which is a switch up from their usual 4-2-3-1, which provided the Sounders with both Will Bruin and Ruidiaz up top. 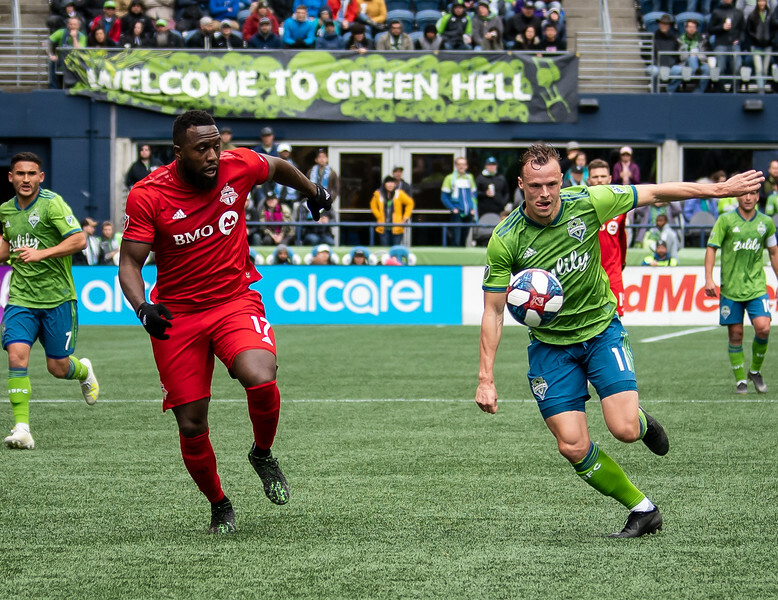 The first goal of the game came off of a penalty kick in the 9th minute when Ola Kamara was talked down in the box by Sounders defender Brad Smith. Zlatan Ibrahimovic steps up and converts the penalty – his 501st career goal. After what seemed to be an offsides cross from some fan’s perspective, LA scored to double their lead from a goal by Ola Kamara in the 40th minute. The Galaxy scored again, ultimately putting the game away in the 52nd minute with a goal from Emanuel Boateng. Even after this 3-0 loss, the Sounders are still in good playoff contention as they are currently in 6th place, one point behind Real Salt Lake with one game in hand (as of 9/24/18). They continue their push for the playoffs against the Colorado Rapids at home on September 29th. The Seattle Sounders have broken another MLS record. They have won 8 games in a row, the most in a single season in the post-shootout era. This is a massive turn around from their record earlier in the year. Before this historic run, they earned just 17 points in 18 games. 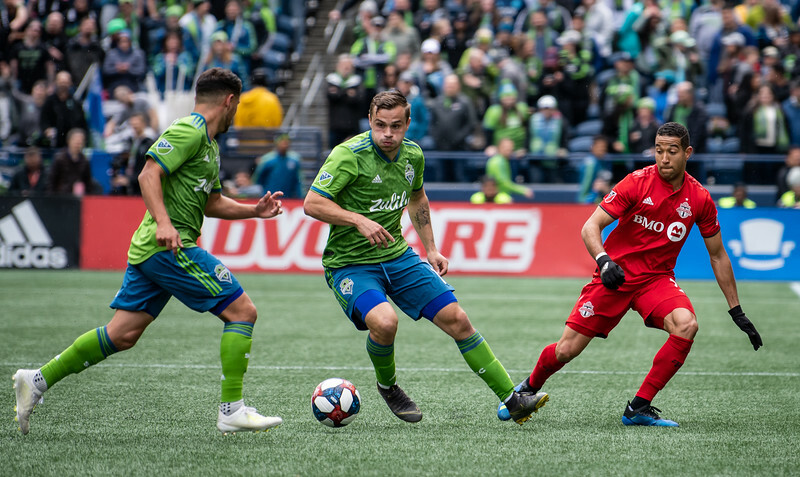 This has completely changed the season for the Seattle Sounders, now they are in a good position to earn a playoff spot – now sitting in 5th place in the Western Conference. 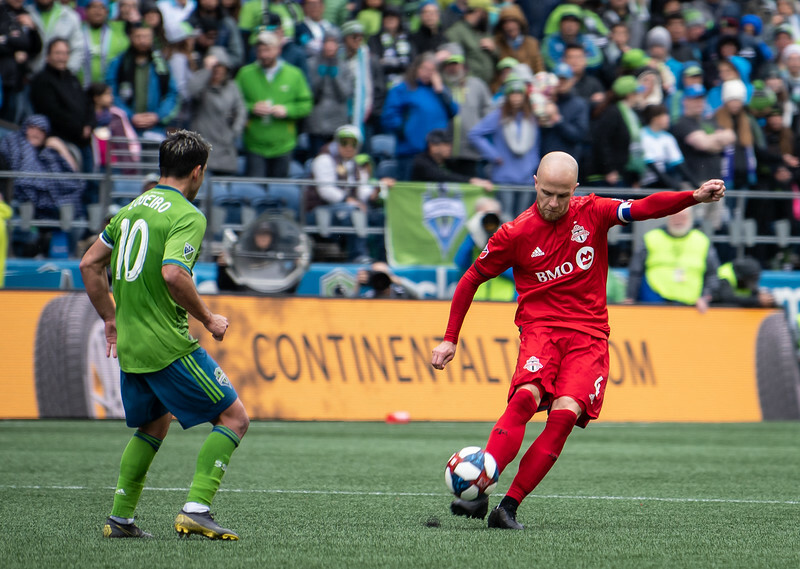 7/21 vs Vancouver – What better way to kick off a record-breaking, season-turning-around run than a 2-0 win over Seattle’s rivals to the north, the Vancouver Whitecaps! On Raul Ruidíaz’s MLS debut, the Sounders secured a solid 3 points. 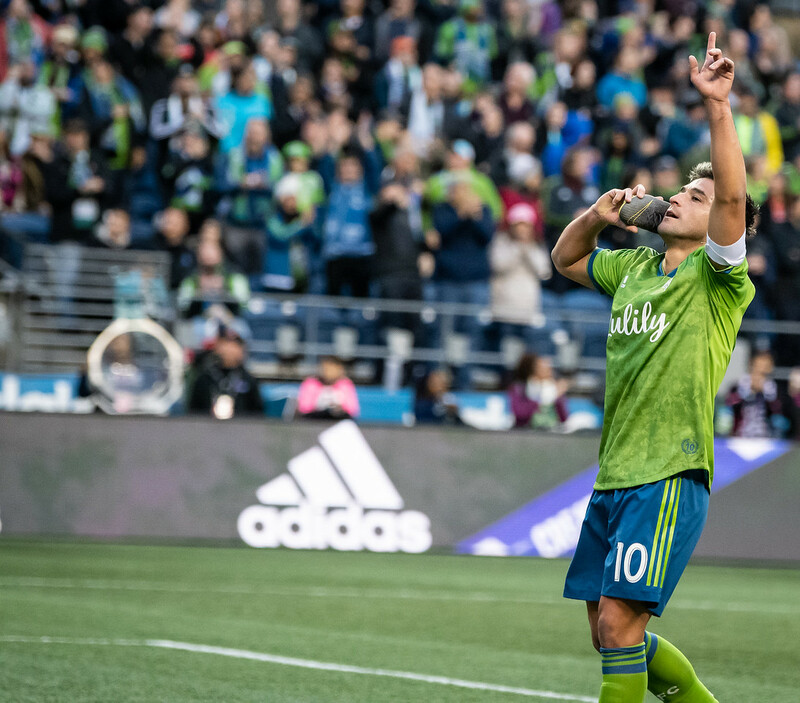 The goals came from a penalty kick due to a handball- which Nico Lodeiro converted and later he doubled his lead due to a long-distance shot & deflection that secured the lead. 7/25 at San Jose – Raul Ruidíaz scored his first MLS goal as the Sounders cruise past the San Jose Earthquakes at Avaya stadium. 7/29 vs NYCFC – Cristian Roldan put the home side up 1-0 in the 36th minute. Shortly after the halftime whistle, Gustav Svensson doubled the lead with a rocket shot from outside the 18. Then, 17 minutes later the away side got onto the scoreboard. However, they could not find an equalizer before Harry Shipp sealed the 3-1 lead. 8/4 at Minnesota – Minnesota was up 1-0 for 70 minutes. The game took a dramatic turn as the Sounders were awarded a penalty kick in minute 90+1, which Nico Lodeiro converted. Then in minute 90+7, Will Bruin chipped the keeper right before the final whistle blew. 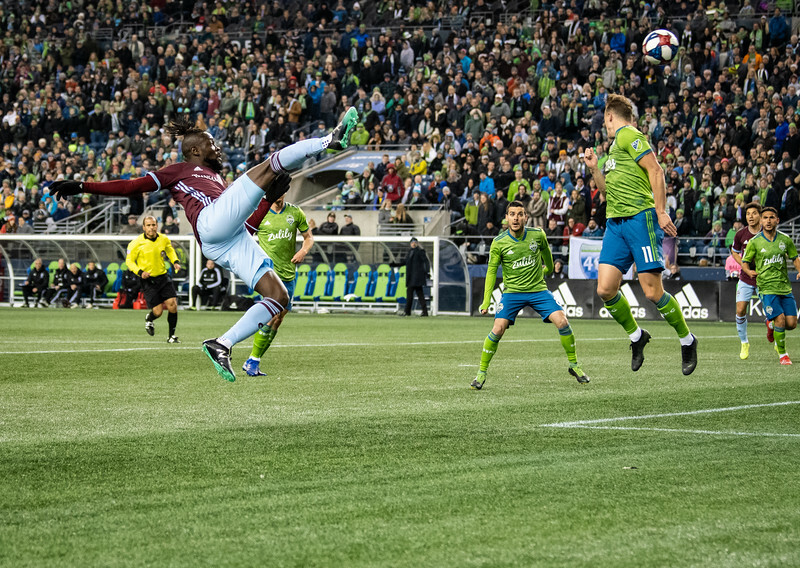 Seattle stealing these three points show off Seattle’s “tough kids” and fighting mentality. This was a big confidence and morale boost for players and fans. 8/12 vs Dallas – Right before the end of the first half Chad Marshall put the home side up 1-0 with a header off a Nico Lodeiro corner kick. Only 7 minutes after half FC Dallas tied it up. In minute 68, Nico Lodeiro put the Sounders ahead. With help from a Dallas red card to Reto Ziegler in minutes 90+1, the Sounders held on to this 2-1 lead. 8/18 vs LA Galaxy– The Sounders rolled past LA in this huge 5-0 home victory. They tied the club record for the largest margin of victory at home and broke the club’s win-streak record with 6 wins in a row,. The goals came from (in order) Marshall (3’), Shipp (18’), Servando Carrasco – own goal (50’), Roldan (59’), Ruidíaz (67’). This victory brought the Sounders up above the playoff line for the first time in 2018! 8/26 at Portland – Another Cascadia victory for the Sounders as they defeat their rivals the Portland Timbers 1-0 at Providence Park. In the 76th minute center-back Kim Kee-Hee flew up the right side and powered in a cross – aiming for Raul Rudíaz, but resulting in a Timbers own goal. This win helped propel them in the standings, and lead them to the top of the coveted Cascadia Cup regional trophy table. 9/1 vs SKC – In the most recent game, the Sounders defeat Sporting Kansas City 3-1 at home. SKC didn’t waste any time getting on the scoreboard, they led 1-0 after a 2nd-minute goal. Raul Rudíaz equalized for Seattle in the 12th minute. Then, in the 52nd minute, a cross from Harry Shipp deflected off of Graham Zusi and in to put Seattle up 2-1. Shortly after Nico Lodeiro added to the scoreboard after converting a penalty kick awarded for a handball on Ike Opara. The most controversial moment of the match was an 81st minute DOGSO (Denial of an Obvious Goal Scoring Opportunity) red card to Chad Marshall. It was a very skeptical call despite going to VAR to justify the PK. The next Sounders game is Saturday, September 15th at Vancouver Whitecaps, let’s hope this streak continues as the Sounders push for the playoffs. This Saturday’s game was pretty much the entire Seattle Sounders’ season so far in 90 minutes. There were great moments, moments that left me scratching my head, moments of yelling at the ref but in the end, again the Sounders lost the game. The good parts. Yay, the Sounders scored a couple of goals, finally in double digits. The offense played as more of a unit than they have all year. Of course, with the good comes the bad. The defense is still having a lot of problems. We can’t finish most of the shots taken. Passing is still a massive problem, though better. But at the end of the game, the Sounders lost again. So let us go over the game in more detail. Before the game, the Sounders announced our newest DP signing, Peruvian striker Raul Ruidiaz. Raul will not be able to start until July 10th. Currently still down Gustav Svensson and Roman Torres due to the World Cup. Also, Stefan Frei due to injury (grumbles about Alan Gordon). The first half was back and forth without a goal scored. There were moments of hope, but nothing came from them. Again, passing seems to be an issue still and set pieces. Now the second half was a lot more exciting. In the span of 30 minutes, 5 goals were scored. Starting in the 48’ Portland’s Larrys Mabiala scores for Portland. Just 3 minutes later, Victor Rodriguez scored for the Sounders. In the 57’, Portland’s Samuel Armenteros scores to retake the lead. Less than 10 minutes later, Chad Marshall pulls the Sounders level. The game-winning goal was scored by Larrys Mabiala. This game had a lot of ups and downs. There were moments where you could see the Sounders of the last 2 years. The window is rapidly closing on the playoffs for the Sounders. We will be getting back some of our injured players in the next few days/weeks. Ruidiaz will be a much-needed addition. There are rumors that more moves are going to be made after the World Cup. Not sure when Roman Torres will get back since he had been injured during the final group stage game. Sounders will play Wednesday, July 4th in Colorado. See you in the terraces.